The theory of the origin of life is the theory of the origin of the cell. It is not known how the first cell appeared on Earth, but it is widely accepted that it was by physicochemical processes. Around the twenties of the last century, A.I. Oparin and J.B.S. Haldane proposed the first physicochemical theories on the origin of life (it was also suggested by C. Darwin in one of his personal letters). The development of theories about the emergence of the first cells is based on suggestions and laboratory experiments simulating the conditions thought to be present during the origin of life on Earth. The origin of life as a physicochemical process has consequences in the field of biology. a) We can create life. A cell could be made from scratch by using molecules that exist today in the current cells and placing them together into a membranous compartment. Currently, synthetic biology, a branch of biology, is undertaking the first serious attempts to make a new cell from just molecules. The whole DNA of a prokaryotic cell has been already synthesized in the laboratory, introduced in a protoplasm, and got a functional new cell. A complete eukaryote chromosome has been synthesized too. b) Existence of extra-terrestrial life. It is possible that physicochemical conditions, similar to those present on Earth during the origin of life, would have been occurred elsewhere in the Universe. So, life forms could have appeared in the past and may exist today in other parts of the Universe. The extraterrestrial life may have emerged in many planets and many times, maybe it is happening right now. 1. What is a living organism? a) Reproduction and transmission of information coded by deoxyribonucleic acid (DNA). b) Maintaining homeostasis by using external energy (metabolism). c) Ability to respond to external and internal stimuli. d) Ability to evolve by Darwinian evolution (variation and natural selection). 2. Where did the first cells appear? The drawbacks of not having a precise definition of life undermine the search for life in other planets. We may recognize what we are seeking, but only because it may be similar to the living organisms we have on Earth, and not because of a good definition. So, if there are organisms under very unusual forms in other planets we may miss them or not be able to classify them as living beings. It is known that some of the organic molecules that make up living organisms on Earth are also present in other planets, as well as in the outer space. This is one reason why it may be plausible the existence of life in other planets which are similar to Earth, i.e. there are bricks for the building. Another reason is the discovery of water in other planets. Water was needed for the origin of life on Earth and it is essential for nowadays living beings. The theory of panspermia (literally seeds everywhere) proposes an extraterrestrial origin of life or at least an extraterrestrial origin of the "seeds" that triggered the origin of cells on Earth. These seeds are supposed to be more or less complex organic molecules. A number of observations support this theory. For example, asteroids, some of them coming from Mars, contain complex organic molecules and it is known that in the outer space there is a huge amount of organic molecules. Although there is no evidence of cells arriving to Earth from other planet, it is thought that a heavy “rain” of organic molecules occurred in the during the first ages of Earth, being a great source of organic material to be used during the origin of cells. Anyway, the origin of cell is still a physicochemical process. 3. When did the first cells appear? Earth is about 4500x106 years old. Fossils point out that first leaving cells were already on Earth between 3500x106 and 3800x106 years ago (Figure 1). During the first 500x106 years, the environment conditions were not suitable for living forms because of high temperature, lack of protective atmosphere, an intense “rain” of meteorites, etcetera. However, 1000 or 1200x106 years later the first cells could have left sedimentary deposits and organic molecules as consequence of their metabolism. It means that the physicochemical processes leading to the first living organisms should have begun before, in a period referred as prebiotic era. Figure 1. Temporal sequence of some relevant events since the beginning of life on Earth. 4. How did the first cell appear? Figure 2. Drawing of the device of Miller and Urey. This device were used to demonstrate the formation of complex organic molecules from simple organic ones. The chemical reactions were developed in an environment that was supposed to be similar to that present in the early Earth. Experiments were done in the fifties of the twentieth century. Organic molecules, plus water and some ions, are the bricks that form living organisms. The more relevant are proteins, nucleic acids, sugars and fat. How were they synthesized in early Earth? There are several plausible scenarios. a) Extreme environmental conditions. If a flask containing CO2, ammonia, methane and hydrogen, is heated at high temperature and is under electric shocks, some complex organic molecules are obtained, such as hydrogen cyanide, formaldehyde, some amino acids, some sugars, purines and pyrimidines (needed for the synthesis of nucleotides). This was the experiment carried out by Miller and Urey when they were trying to replicate the earliest environment on Earth (Figure 2). It does not prove that the origin of life was in this way. However, it shows that complex organic molecules can be formed by physicochemical reactions. Furthermore, different places on early Earth could have had distinct environmental features that yielded different sets of complex organic molecules. Plausible sites for prebiotic synthesis are hot sea vents, fumaroles and hot springs, where strong gradients of temperature and high water pressure, plus minerals, could be found. Minerals may have been key players because they could work as catalyzers facilitating the chemical reactions. b) Extraterrestrial origin. It has been demonstrated that more or less complex organic molecules can be synthetized in the outer space, and they can be found in comets and meteorites. It is possible that a huge amount of extraterrestrial organic compounds arrived to the Earth surface, which could have then started the chemical reactions for the origin of life. So, we already have organic molecules. However, the more relevant molecules for the cell are present as organic polymers: aminoacids as units of proteins, nucleotides as DNA and RNA, and some sugars as starch and glycogen. Nowadays, cells synthesize these polymers, but in the early Earth it was a problem because joining molecules to get long chains is not an easy task. It has not been found yet a good polymerization system that could have been worked properly in the origin of life. However, several hypothesis have been proposed. a) Heating and drying. In the laboratory, it has been shown that heating semi dry compounds may yield chains of organic molecules. b) Minerals. Catalysis by minerals, such as polyphosphates and other catalytic minerals, produces polymers having units randomly ordered. Minerals could have been sheltered places in an adverse atmosphere and the surface of some minerals, such as clay, may act as catalytic centers for chemical reactions, which together with heat and water may produce polymers. In laboratory experiments, this process has been demonstrated for RNA and fatty acids, which are needed for cell membranes. c) Fumaroles. Again, sea vents, fumaroles and hot springs provide strong gradients of temperature and water pressure that facilitate chemical reactions. Organic molecules are currently produced in fumaroles. d) Hydrotermal vents in land fresh water. They are places near volcanos where hydration and drying cycles may concentrate organic compounds and facilitate chemical reactions at high temperatures. Furthermore, these environments are more suitable for the spontaneous assembling of membranes than the sea, and there are low concentrations of calcium and magnesium, ions that inhibit the formation and integrity of membranes. Instead of in the sea, many studies point to land hydrothermal vents as the places where the origin of the cells took place. e) Lipidic membranes. In several laboratory experiments have been demonstrated that the surface of lipidic membranes, as cell membranes, can attract, select, and concentrate simple organic molecules. At the membranes, the organic molecules are very close and the lipidic environment may facilitate the chemical reactions such as those involving nucleotides and aminoacids. This scenario is interesting because it solves two questions: why only some specific types of organic molecules got inlcuded in membrane bags or vesicles, and how the protocells were first formed. One of the major steps toward the birth of the first cells was the development of a barrier to separate intracellular and extracellular environments. Membranes provide many advantages: a) molecules for metabolic reactions are held together and not lost by diffusion; therefore, the probability for chemical reactions is higher and hence more efficient; b) internal molecules are not shared with neighbors, so new advantageous molecules for new chemical pathways are not used by competitors; c) a proper internal environment can be set to improve chemical reactions and to counteract or buffer external environmental changes as well. This is known as homeostasis. Lipid membranes can be easily made from amphipathic lipids, which have hydrophilic and hydrophobic parts. All cell membranes contain amphipathic lipids: glycerophospholipids and sphingolipids. However, the ancient membrane lipids could have been different because the current membrane lipids need a complex metabolic path to be synthesized. Whatever they were, when added to water solutions, and after applying mechanical forces to the solution, amphipathic lipids spontaneously form thin sheets, which are similar to cell membranes. Current membrane lipids have two fatty acid chains. This feature allows the formation of membranes at a micromolar concentration of lipids. Lipids with only one fatty acid chain need milimolar concentrations to spontaneously form a membrane. Furthermore, 10 to 14 carbons in the fatty acid chains make the membrane structure more stable. It is possible to regulate membrane fluidity by changing the number of double bonds between carbons and the concentration of sterols. It is unknown what type of lipids were components of the first membranes, but current membranes are all made up of glycerophospholipids and sphingolipids, plus sterols. Two ways for the association between organic molecules , such as nucleotides or aminoacids, and membranes have been suggested. a) It is plausible that water shaking could have led membranes sheets to form vesicles or little bags that enclosed groups of molecules. By chemical reactions, these molecules increased in number and the vesicle became larger. At one point, the vesicles got the ability to split themselves in two by strangulation, giving rise to two new vesicles with the same types of molecules inside as the mother vesicle. The growing of the vesicles could have happened thanks to the properties of the membrane: allowing extracellular supply of small molecules that could freely cross the membrane, but hampering the exit of larger molecules (like polymers). b) Another scenario suggests that there was an association between simple organic molecules and lipidic membranes. Membranes atracted and boosted the concentration of organic molecules in their surfaces and facilitated chemical reactions. Thus, polymers (oligopeptides and oligonucleotides) were originated in close association with membranes and gained complexity over the time. At one point, these macromolecules were trapped into vesicles or, if synthesized in vesicles membranes, they got the ability to cross the membrane and remain inside the vesicle. 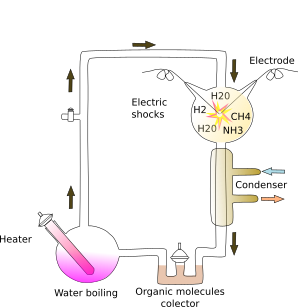 If this mechanism is the real one, the order of events should be reconsidered because membranes were then the most important elements during the formation of the first protocells. Another major step during the origin of life was the increase in number of some polymers that could maintain a similar sequence of monomers, i.e., it was possible to produce copies of some polymers. It has been suggested that it could have happened by self-replication. Some molecules were capable of making copies of themselves. It led to a main property of life: transmission of information. There are two types of information that can be transmitted by self-replication of polymers: the particular sequence of monomers and the spatial organization of the newly synthesized molecule (3D structure depends on the sequence of monomers). Do we have already a genotype and a phenotype? The monomers and energy to synthetize these polymers were taken from the environment because they could cross membranes. Inside the vesicles, more or less accurate copies of some polymers were made. However, the self-replication process could make mistakes leading to variations of the monomers sequences. Some polymers with slightly different sequences could have had better performance during their own replication and yield more copies. Then, membrane vesicles with more productive molecules could grow faster, get more external resources and leave more offspring. So, we have a competition for external resources by populations of vesicles having different sets of polymers. They had discovered another property of life: variability and natural selection, i.e., Darwinian evolution. Some authors think that a type of molecule was not able to accomplish all these steps by itself. Instead, groups of molecules connected by chemical reactions could have grown by increasing the number of every malecular type of the network. During the division of the vesicles, complete sets of molecules were distributed into the two new generated vesicles. So, we have self-replication of the whole molecular network. This should have been flexible enough to change the weights of the chemical connections, as well as to incorporate new elements. Figure 3. 3D form of a transfer RNA molecule present in the current cells. Complementary nucleotides from different parts of the molecule stablish electrical interactions (green lines), and fold the polymer into a particular 3D conformation. If it is assumed that a single type of molecule was the first self-replicator, which one was it? DNA is not a very reactive molecule and must be “manipulated” by proteins, which are the real workers of cells. In the current cells, proteins are synthesized from DNA based information and DNA needs proteins. Then, what was first, proteins or DNA? Eyes turn to RNA (Figure 3). Some RNA molecules have the ability to carry out enzymatic reactions (that is why they are referred as ribozymes). For example, ribonucleoproteins are able to cut RNA molecules and join them (RNA splicing), and protein synthesis in ribosomes is accomplished by ribosomal RNA. Furthermore, it is plausible, though unlikely, that RNA molecules could make copies of themselves by synthesizing a complementary sequence of their own sequence of nucleotides. It is known that nucleotide sequence determines the 3D form of RNA, influencing stability and activity. So, sequence and spatial conformations may have worked together to make more competitive molecules by increasing their stability and yielding more copies. In this scenario, some errors during the copy process may have occurred ("mutations") that gave more or less stable molecules. Darwinian competition and selection could have been started. With the pass of time, vesicles were enriched in those RNAs that make copies more efficiently. Then, sequence (genotype?) and spatial conformation (phenotype?) could give profitable features. All these steps have been proposed that happend during the prebiotic period on Earth, and are included in a theory known as the RNA world. However, a “metabolic world” based on networks of chemical reactions has also some experimental support. In this model, replication was not done by just one type of molecules, but by a group of molecules connected by chemical reactions. At some point, a membrane was also needed, as well as growing and division of the system, and the ability of changing (for example, increasing the complexity of the system). Authors supporting the “metabolic world” do not discard a major role of RNA during the origin of life. However, RNA could have participated during later steps of the evolution of these molecular systems. In fact, some authors suggest that RNA would initially be a parasite of the chemical systems. Finally, RNA took control of the system. Independently of self-replication and competition, interactions between different types of molecules (polypeptides, DNA, RNA, lipids, sugars) should have happened, leading to complex chemical systems. It can be imagined that the association of two type of molecules, let's say RNA and some polypeptides, would have ended up being beneficial for both. Later, the complexity increased and new molecules came into the net of chemical interactions like DNA. With the pass of the time the whole molecular mix evolves and faces environmental selection by changing the interactions between each other. This introduces a new concept: coevolution of molecular forms. This could have happened 3500-4000x106 years ago. At some point of this story, RNA must have been involved in the synthesis of proteins (polypeptides). This was a critical step because a code was invented, with 3 particular nucleotides in a particular order meaning a particular amino acid. This code is known as genetic code, which is present in all living organisms. Every cell studied so far shows the same triplets of nucleotides for the same amino acids (with some minor exceptions). The universality of the genetic code indicates that it was invented only one time and was inherited by all living organisms. Then, all living forms are connected by lineages of descendants, creating generation after generation a tree of life. The organisms placed in its root invented the genetic code. 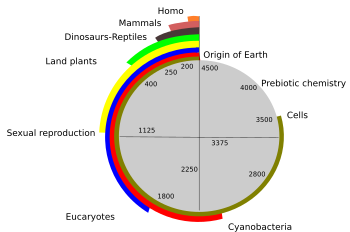 These first organisms are known as LUCA (last universal common ancestor). In current cells, the information inherited by one generation of cells from a previous one is coded in DNA, not in RNA, neither in proteins. 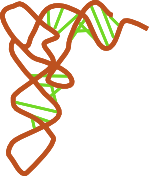 Compared to RNA, DNA is a more stable molecule because it is double strand, it is easier to be replicated and repaired. There is a type of enzymes known as reverse transcriptases with the ability to translate RNA sequences into DNA sequences. Many viruses, such as the AIDS virus, contain this enzyme for convert the information of the RNA (present in the infectious phase: virion) into DNA to make posible the replication inside the host cell. At some point before LUCA, the information moved from RNA to DNA, which became the container for store, transcript and transmit the information needed to form a new protocell. There are many uncertainties and controversies about each one of these steps, and others not mentioned above. How did events happen?, what were the most important molecules?, how was the real environment in every step?, and many more questions are still under heated debate. There is no doubt that get to know how was the origin of life, i.e., the origin of the first cells, is one of the main scientific challenges. Michalak R . RNA world - the dark matter of evolutionary genomics. Journal of evolution biology. 2006. 19(6):1768-1774. Müller UF . Recreating an RNA world. Cell and molecular life science. 2006. 63:1278-1293. Oparin AI . Origen de la vida en la Tierra. 1970. Editorial Tecnos S.A. Traducción de la tercera edición rusa. Orgel LE . Origen de la vida sobre la Tierra. Investigación y Ciencia. 219:47-53. Peretó J . Controversies on the origin of life. International microbiology. 2005. 8:23-31. Robinson R . Jump-starting a cellular world: Investigating the origin of life, from soup to networks. PLoS Biology. 2005. 3(11):e396. Shapiro R . El origen de la vida. Investigación y Ciencia. 2007. 371:18-25. Warmflash D, Weiss B . ¿Vino de otro mundo la vida?. Investigación y Ciencia. 2006. 352:24-31.